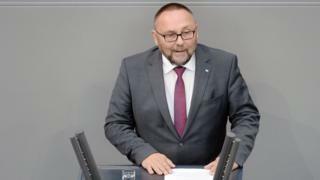 German far-right politician Frank Magnitz has been beaten up and severely injured in an attack seen by police as politically motivated. The leader of Alternative for Germany (AfD) in Bremen was attacked by at least three masked men in the centre of the northern city on Monday. The attackers knocked him unconscious with a piece of wood and kicked him in the head, AfD officials said. The government and politicians across the spectrum condemned the attack. Mr Magnitz, 66, had just left a new year reception in Bremen's Kunsthalle art museum when he was attacked in the city's Goetheplatz as he walked to a central car park. Police said he was beaten over the head with an unknown object by three men who then fled. Two local tradesman came to his aid and he was taken to hospital. Speaking from hospital on Tuesday, Mr Magnitz said he had little memory of what happened. Joint party leader Alice Weidel described the incident as an "assassination attempt" while local officials in Bremen blamed "incitement" from the centre-left SPD and Green parties. Image caption This edited picture shows Frank Magnitz in hospital after what Mr Meuthen called "a cowardly and sickening attack"
Another party spokesman, Jörg Meuthen, tweeted a photo of Mr Magnitz lying unconscious in his hospital bed and said he had been left "half-dead". He had a big gash on his forehead and severe bruising around his right eye. AfD entered the national parliament (Bundestag) for the first time last year with 94 seats and now has representatives in every German state parliament. Its anti-immigration platform has struck a chord, particularly in eastern Germany where it hopes to make gains in three state elections this year. AfD is also eyeing the May 2019 European Parliament elections. Last week an AfD office in the eastern town of Döbeln was damaged by an explosion. No-one was hurt. SPD leader Andrea Nahles said that AfD was a "political opponent" of Germany's tolerant society but anyone trying to fight it with violence "betrays these values and jeopardises our co-existence".